You can spice things up around the office with this Edoile wedge pump from Bandolino. Featuring a smooth leather upper with a bold buckle adornment to add tonal detail. 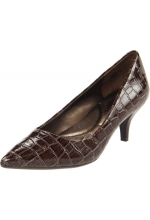 Modest wedge and dual texture design make this versatile heel ideal for the office and beyond.